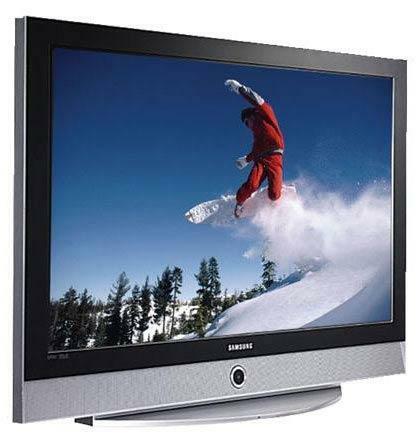 The SP-R4232 is Samsung's 20005 EDTV plasma offering and the least expensive model in the company's lineup. It has a native resolution of 852x480, which means that it should be able to display every detail of a DVD, but won't show as much detail with HDTV or computer sources as step-up models. The SP-R4232 also comes equipped with both a built-in ATSC tuner and a CableCard slot, which means you can watch over-the-air HDTV and digital cable without external hardware. Its connectivity is highlighted by an HDMI port, a PC input, two component-video inputs, and both optical and coaxial digital audio outputs. While it's commonplace for newer TVs to have a digital audio output, having the option of either coaxial or optical might by useful for some home-theater setups. Plasma and LCD panels may look similar, but the flat screen and thin profile is where the similarities end. Plasma screens, uses a matrix of tiny gas plasma cells charged by precise electrical voltages to create a picture. LCD screens (liquid crystal display) are in layman's terms sandwiches made up of liquid crystal pushed in the space between two glass plates. Images are created by varying the amount electrical charge applied to the crystals. It's not what's happening behind the screen that's important - it's how the screen performs as a television that matters the most. In that regard, both plasma and LCD sets produce excellent pictures, although many home entertainment specialists will tell you they're not quite up to the standard of the bulky old CRT televisions yet (although they're quickly catching up). Those same home entertainment specialists will tell you that for basic home theatre-like usage, plasma screens have a slight edge over LCDs. This is because plasma screens can display blacks more accurately than LCDs can, which means better contrast and detail in dark-coloured television or movie scenes. The nature of LCD technology, where a backlight shines through the LCD layer, means it's hard for it to achieve true blacks because there's always some light leakage from between pixels. This is steadily improving with every new generation of LCD, however. 3. What advantages does plasma have over LCD? Apart from better contrast due to its ability to show deeper blacks, plasma screens typically have better viewing angles than LCD. Viewing angles are how far you can sit on either side of a screen before the picture's quality is affected. You tend to see some brightness and colour shift when you're on too far of an angle with LCDs, while a plasma's picture remains fairly solid. Plasmas can also produce a brighter colour, once again due to light leakage on an LCD affecting its colour saturation. Plasma pundits will also tell you that some LCD screens have a tendency to blur images, particularly during fast moving scenes in movies or in sports. While that was true for older generation LCD screens, newer models have improved significantly - so much so that the differences in performance between LCDs and plasmas in this regard is almost negligible. Perhaps the biggest advantage plasmas have now over their LCD cousins is price, particularly in the large screen end of the market. Plasmas can come in much larger sizes than LCDs at a cheaper price. 4. What advantages does LCD have over plasma? LCDs tend to have higher native resolution than plasmas of the same size, which means more pixels on a screen resulting in a sharper image. This makes LCDs an ideal choice for any true high definition television you plan to watch. LCDs consume less power than plasma screens, with some estimates ranging that power saving at up to 30 per cent less than plasma. LCDs are also generally lighter than similar sized plasmas, making it easier to move around or wall mount. LCD pundits also point to the fact that LCDs have a longer lifespan than plasma screens. This was true of earlier plasma models, which would lose half of their brightness after more than 20,000 hours of viewing. Later plasma generations have bumped that up to anything between 30,000 and 60,000 hours. LCDs, on the other hand, are guaranteed for 60,000 hours. You might have also heard that plasmas suffer from screen burn in, an affliction not as commonly associated with LCDs. Screen burn in occurs when an image is left too long on a screen, resulting in a ghost of that image burned in permanently. Newer plasmas are less susceptible to this thanks to improved technology and other features such built-in screen savers. 5. Better value: plasma or LCD? If you're in the market for a big screen television, then we'd suggest plasma as a safe bet. Plasmas give you more bang for your buck at the big end of town, and while LCDs can give you better resolution, the price difference is currently too wide. However, if money's not an issue and you want the sharpest image in town, then a large LCD is for you. At the smaller end of things (15" to 36" TVs), LCD is the only way to go if you want something slim and tasteful. Free classified advertising for individuals and website owners to promote their products. Plasma Tv Reviews, Plasma Tv News, Plasma Tv specifications , Plasma TV Tips and Tutorial to Choose the Best Plasma Tv. Excellent clock info - cuckoo clocks, clock radios, grandfather clocks and all the others. Free, in-depth clock information. Only the best and finest free offers, free trials and more of free stuff from leading brands. Deeply disconted offers (better than free) are also available. Find the highest quality liquid vitamins and supplements for your great health. Secure online shopping. Site offers information on service by Direcway and Wildblue. Other information available on DirecTv, DishNetwork Tv, Sirius satellite radio and XM satellite radio. Offers information about North Carolina. Sick of your dog or puppy going to the toilet all over your house? Without proper training a dog quickly thinks they are master of the home, train your dog to obey with the click of a finger using the best dog training guides ever and take back your role. Doggie Land is one of the best non-fee based dogs directories on the internet and contains only the best and most accurate dogs information on the internet. We update our site regularly and do our best to make sure that all dog lovers feel at home. Discover the fastest way to build big arms and gain muscle mass! How to build muscle mass and gain weight. Everything about satellite tv, directv, satellite dishes and dish network. Computer store directory for Canada and the United States. Online Auction without the Auction... Silent Auction Seller, Online Auction, Consignment Thrift Shop, Outlet Shopping Center Mall, Retail Shopping Mall, Sporting Goods, Sell my Car, Buy a Car, Industrial Goods and Services. Offers information on the sport of Brazilian Jiu Jitsu. North Star Metal is certified ISO 9002 industry leader in precision metal design and sheet Metal production. Genuine kissing advice and juicy tips on how to kiss. A completely free online kissing ebook and instructional guide. Step by step french kissing, romance tips, and how to master the art of kissing. Free kissing articles and romantic kissing blog. We have the largest directory of coffee information for the coffee lover. The best deals and the latest information on free satellite TV systems and service from DirecTV and Dish Network. FoothillCreek.com is your one stop resource for all kinds of electronics and entertainment including audio, video, computers, and gadgets of all kinds. Products include extensive editor and user reviews to help you find exactly what you're looking for. This site offers software, tips, and ideas and articles to help plan a comfortable and exciting backpacking trip. The plasma is heavy. At least two people are required to carry this equipment. When lifting the TV Floor Stand, please don't lift it by holding its two vertical tubes as these tubes simply insert into the base of the stand and are not permanently attached to it. Please be sure to place the plasma floor stand on an even floor – uneven ground will cause the plasma to become dangerously unstable with the potential of tipping over. Do not mount a TV on plasterboard UNDER ANY CIRCUMSTANCES. Plasterboard is not strong enough for a plasma TV. For plasterboard mounting use a smaller LCD TV. Ensure the plasma TV screen is insured for accidental damage. Ensure your wall is either brick or concrete. Concrete is ideal, as the mounts will will work well in this situation. Using brick can make the bolts which hold the TV move after installation. It can still work fine but is something you must be aware of. Decide where to put your TV cables. Using white tubing for your TV cables is ideal. Setup the plasma floor stand on an even surface. With the help of another person, lift the plasma and the mounting bracket (already attached to the plasma TV) and place it on the plasma floor stand by aligning the 4 buttons on the mounting bracket with the 4 slots of the plasma floor stand. Lower the safety latch on the mounting bracket to secure the plasma, making sure latch is completely engaged. Plug in the power cord and the video source and you are ready to enjoy your show. Make sure the plasma is not tilted to the side or up/down. Plasma needs to be at an upright position at all times. HDMI is a new standard digital connection between A/V devices, such as a set-top box, DVD player or A/V receiver, and a digital television. HDMI offers exceptional video and audio quality with a single quick-disconnect connector. It supports multi-channel digital audio transmissions and component video color spacing for true rendering of HD video. High-quality surround sound can be experienced with just the speakers built into your TV. SRS TruSurround XT technology delivers an amazing, simulated 3-D effect with clear dialog and powerful bass. The interior hidden speaker system with DACS (Dual Acoustic Chamber System) simulates dual separate chambers for each speaker to maximize low-range-sound performance and enhance sound clarity. A built-in brightness sensor automatically detects the ambient light and adjusts the TV brightness accordingly for perfect pictures in any viewing conditions. Watch two program sources at once Picture-in-Picture. Compatible with TV, DVD, and PC connections.